Big changes are coming to Paidverts on the 21st of July 2016. BAP will be reset and the content of adpacks will be changed. Last chance to buy adpacks with 3100 BAP! New adpacks will contain only 2400 BAP! If you would be buying adpacks regularly you will not be paying any daily BAP tax! Now we will go through all the changes in detail. All BAP will be deleted on the 21st of July 2016. BAP will be converted to shares at a rate of 200 BAP/share (Royalty Position). It will bring faster supply of ads, higher ad values and faster earnings. The site will be much more alive. If you have your own site or reflink it is maybe the best to purchase banner advertisement for BAP. You will get more money from sales/referrals than if you would be waiting for RP price to gain some considerable value in order to sell them for money. I bought the banner advertising for almost all of my BAP too. For the rest of my BAP I used the option 1 = convert BAP to RP. I believe it will bring me more money in long term. Adpacks purchased after 7/21/2016 will contain only 2400 BAP instead of previous 3100 BAP. Earnings from each adpack will be lowered from 155% to 120%. This will contribute to site’s stability. There will be no need for resets in the future. Adpacks with 2400 BAP will cost $1 instead of previous $1.05. Promotion – 155% earnings till 7/21/2016 – only 2 days left! Adpacks purchased till 7/21/2016 will still contain 3100 BAP = 155% earnings. Adpack for $1.05 earns $1.55. BAP purchased in adpacks from now till 7/21/2016 will not be reset. You keep them! You have the last chance to purchase adpacks with high earnings. After that it will never be possible again. If you purchase an adpack from 7/21/2016 you will not be paying the daily BAP tax for next 14 days (you will save 1400 BAP!). So purchase an adpack every 14 days and you will not pay any BAP tax at all! Sister site of Paidverts, MyTrafficValue, will undergo changes too. As of 7/21/2016 the option to join their 130% Fast Track Investment investment program will be closed. 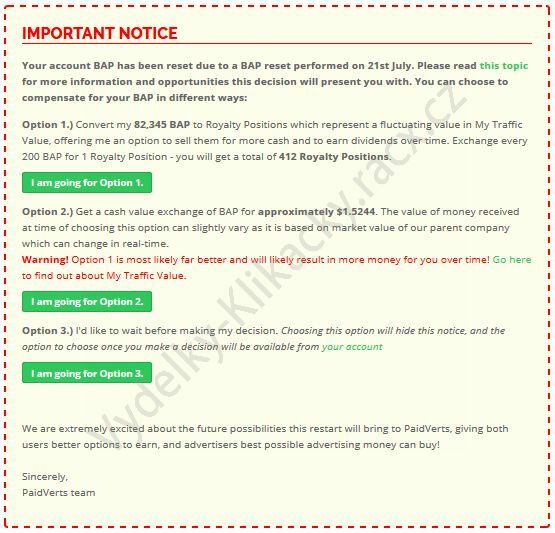 If you want to join this plan with high return you can do so till 7/21/2016. The program will be closed for new investments. Old investments will go as usual, earnings will be crediting till you will be fully repaid. The site expects from this change that Royalty Positions (shares) will gain a lot of value, and dividends will be paid soon. The fees at BAP market will be lowered from 15% to 5%. If you ever decide to use Paidverts, use your MyTrafficValue account to login to Paidverts.